There is often a mismatch between cellular technologies, WiFi and other short range wireless for applications in the Internet of Things. So its very interesting that Parallel Wireless in the US is combining both WiFi and LTE cellular links in a heterogeneous network 'HetNet' trial to provide WiFi connections on buses in Singapore. Mobile operators in Singapore are looking for innovative technologies to address spectrum scarcity as subscriber demand is growing rapidly with smartphone penetration reaching 130 devices per 100 people. Maximizing the utilization of the spectrum and easing network congestion in areas with heavy human traffic is necessary to meet the requirements of the Infocomm Development Authority of Singapore (iDA) to connect the whole nation as a part of world's-first Smart Nation initiative. The on-Bus HetNet technology uses network virtualisation and changes the economics of pervasive mobile coverage with real-time HetNet orchestration, traffic prioritization made possible by HetNet Gateway (HNG). All bus riders receive seamless, high throughput connectivity from an on-bus multi-mode LTE/Wi-Fi converged wireless system from a small cell with integrated backhaul including licensed assisted backhaul. This needs new software in the radio access network (RAN) to enable carrier aggregation for backhaul and so allows the end user throughput can be increased 10 times (up to 300 Mbps). The HetNet solution with the Parallel Wireless vRAN architecture allows M1 as the network operator to better manage network demands, enable intelligent traffic steering and load balancing on public transport. The network can seamlessly scale capacity up or down with intelligent traffic offload to address the changing usage patterns, while maintaining seamless end user Quality of Service. In the future, the same small cell can include M2M features to provide fleet management capabilities to transit companies. M1 provides mobile and fixed services to over 2 million customers and was the first operator to offer nationwide 4G service, as well as ultra high-speed fixed broadband, fixed voice and other services on the Next Generation Nationwide Broadband Network (NGNBN). "We are proud to support M1's WiFi-On-The-Go service HetNet trial, Singapore's first connected public bus service as a part of the iDA initiative to make Singapore the worlds-first Smart Nation." said Steve Papa, Founder, Chairman and CEO, Parallel Wireless. "Innovative operators like M1 are leading a market disruption in new growth areas such as enabling Smart Cities. Parallel Wireless's cost-effective and efficient HetNet solution was designed to make this disruption a reality." One of the pioneers of the Internet of Things, Greenpeak Technologies, has been bought as part of the continuing consolidation in the semiconductor industry. Qorvo is the result of the merger of RF MicroDevices and GaAs speciliast TriQuint in 2014, and bringing GreenPeak in gives ultra-low power, short range RF communication technology for IoT. The acquisition of Netherlands-based GreenPeak will allow Qorvo to expand its customer offering to include highly integrated RF solutions and systems-on-a-chip (SoCs) for the connected home and the rapidly growing Internet of Things (IoT). James Klein, president of Qorvo’s Infrastructure and Defense Products (IDP) group. Links will head up the IDP group within Qorvo. “Our team is excited to join Qorvo and continue our legacy of creating ultra-low power RF solutions for our customers. We believe Qorvo will be a great environment for the GreenPeak team to grow as part of a much larger company serving many more global customers,” he said. GreenPeak Technologies adds longer range, robustness and best-in-class WiFi interference rejection with no latency in production-ready reference designs that will allow quick time to market for integration into smart home and IoT applications. In 2015, GreenPeak celebrated shipment of its 100 millionth ZigBee chip to the smart home market. According to research firm Gartner, Smart Home networking and IoT markets addressed by 802.15.4, ZigBee and Bluetooth Low Energy (BLE) technology are estimated to grow to $2.3 billion by 2020; and related smart markets such as retail, agriculture, automotive, lifestyle and commercial lighting are expected to grow to $4.9 billion by 2020. Beyond smart home networking, demand is growing to connect a variety of devices including HVAC, energy, security, home health, and remote controls utilizing innovative ultra-low power wireless data communication SoCs. I'm often amazed by what ends up being popular month to month, and how some of the older stories keep coming back up. IDT's deal with ProDrive to reduce switch latency is popular, and the Japanese taxis moving to IoT connection is always interesting. But what about Atmel's IoT hardware security or the 3D printed batteries that have fallen off the list from February. 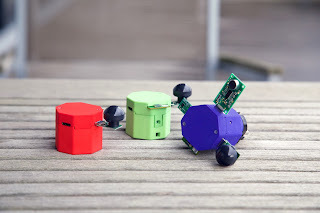 Plug-and-play is one of the big challenges for the Internet of Things, and Belgian spin out VersaSense has developed a wireless system that requires no configuration by the user. MicroPnP is a complete IoT hardware and software platform that reduces the total cost of ownership for sensing and control systems using the ultra low power SmartMesh IP from Linear Technology. SmartMesh is the technology behind the Dust microcontrollers that Linear acquired at the end of 2011. Versasense provides the plug-and-play identification of sensors and actuators at 10 million times lower power than USB, and, critically, includes industry-grade security from the embedded sensor to the cloud, as Dust were the co-chairs of the IETF IoT security standard committee. The SmartMesh IP provides 99.999% end-to-end reliability as well as a battery life of up to 10 years, with accurate real time tracking of energy reserves across the entire network. VersaSense is a spin-off company of iMinds-DistriNet at Leuven University and designs and manufactures a complete range of products for the next-generation of industrial wireless sensing and control systems. This includes: ultra-low power wireless hub devices, a wide range of sensors and actuators, and end-to-end software support. VersaSense also designs and deploys specialised sensing systems for customers working in data center monitoring, chemical pipeline sensing, precision farming and building energy monitoring. This has led to VersaSense supporting flexible usage models, so that designers can integrate MicroPnP in a network through ‘sensing as a product’, or consume data through ‘sensing as a service’. With 7m devices connected to the Internet of Things, SIGFOX is one of the world’s leading IoT providers, so the fact that it is opening up its SIGFOX Cloud is significant. The company’s unique solution is based on a dedicated global network of low power radio connectivity, and up until now you had to sign up with the company's own cloud service for the real-time analytics and to intelligently automate operations. Now the company has developed a 'cloud-to-cloud integration' to Microsoft's Azure IoT Hub, which provides an easy and secure way to connect and control millions of devices. The collaboration allows users to access both SIGFOX’s low-power, wide-area network and the power of advanced analytics and storage on Microsoft Azure to collect, analyse and visualize large quantities of operational data produced by their connected devices and applications. The deal makes a lot of sense for large operators who want to develop their own analytics using the Azure Hub rather than the SIGFOX system. “Integration with Microsoft Azure IoT Hub in SIGFOX’s Cloud is a key step in the evolution of the IoT, providing customers with a great alternative to investing large amounts of resources to develop and manage data storage and management themselves,” said Stuart Lodge, SIGFOX executive vice president global sales and partners. “We are thrilled to have Microsoft as part of our global ecosystem as it will empower our customers’ asset management tool efficiency and lower their costs”. The “Connect your City” hackathon in San Francisco, when 150 participants developed prototypes of connected hardware utilizing the network and the platform. The four winning teams developed smart solutions for the City of San Francisco, which is covered by the SIGFOX network. System integrator Econocom enables the French company Servair to improve logistics efficiency and better secure Paris Orly Airport runways. The innovative logistics solution uses a network of connected buttons for sending parcel-removal notifications to Servair employees. At Grand Lyon Métropole in France, a solution developed by Exakis measures real-time air quality in the city via sensors attached to buses and trams. The Lyon Air platform, to be launched soon, is fully monitored in Azure. A programme developed by the IoT consulting firm Eridanis allows GRT Gaz, one of Europe’s biggest natural gas transportation companies, to continuously monitor the condition of its distribution network through connected terminals. The terminals immediately transmit signals, if sensors detect any changes in their position.